It’s time to haul out and dust off my poignant, heart-warming, Hallmark Channel-worthy Christmas commentary. The one about how I hate Santa. Grab a tissue. I expect I’m about to be called a grinch, or a scrooge, or worse, but here goes. 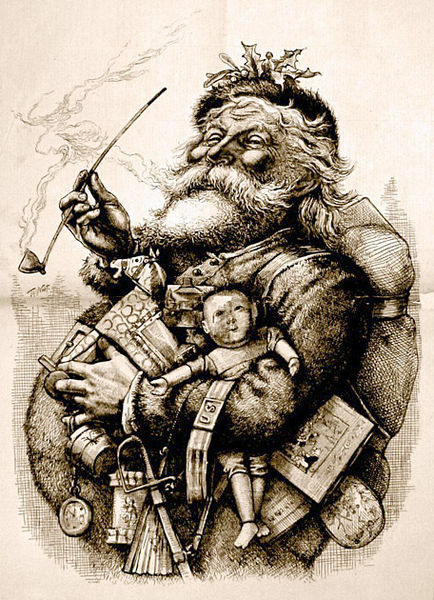 I don’t believe it’s good for children to be taught the myth about Santa Claus. Why is it important to so many parents that their little ones continue to believe a lie? We don’t call it a lie, but it is. It’s a big fat one, and I have to believe that this grand deception has a definite and negative effect on our children’s perception of truth. Most, if not all, of us have struggled to some degree with the hypocrisy of teaching our children to always be truthful, yet feeding them a line about Santa. We fear the day we’re going to have to own up to our duplicity and wonder how it will affect them. I believe it has to be, at the very least, a huge disappointment, and if a child is fed a steady diet of fanciful and fun but false stories, i.e. Santa, Easter Bunny, Tooth Fairy, Wish Upon a Star and Your Dreams Will Come True, he will be more susceptible in later life to swallowing all kinds of spiritual nonsense. Or, he may be so disillusioned because of the abuse of his trusting heart that he won’t want to believe anything. So, instead of putting our faith and trust in the God who is real and is the Creator and Provider of all good things, we choose to promote, defend, and believe in a mythical, godlike creature and in the process cheat our kids out of the wonderfully incredible truth that there is Someone who really can deliver gifts to all the children all over the world in a single night. And the security of knowing that this God loves them and is always with them and is able to give them everything they need. God is the real deal; Santa is an imaginary pseudogod. Do we hang on to Santa because our faith is weak and we don’t feel confident teaching even our children that God is sufficient and all-powerful? Or is it that we just don’t like how God operates because he doesn’t give us all the material things we want? Maybe we like Santa better because he gives but doesn’t make any demands on us. Sure, he keeps a list of who’s naughty and nice, but the naughty kids, and adults, still get presents. So he makes us feel all warm and fuzzy ‘cause he’s a great big sugar daddy, and we don’t even have to spend any time with him. Some, I imagine, get on the Santa bandwagon because they love the look of wonder in a child’s eyes as he or she takes in the whole story of the North Pole and the flying reindeer and sliding down chimneys. But let’s face it, what’s the most wonderful thing about Santa to children? It’s the bagful of toys for all the girls and boys. Santa doesn’t discipline or allow trials in our lives to teach and refine us. Nobody wants those things for Christmas, or anytime, but they come with the package when you’re dealing with truth. But how do our children approach the truth about God when they learn that what they’ve believed for so long has been a lie? Will they totally abandon the idea of absolute truth as so many have nowadays, so that truth is relative and then nothing really is true at all? Santa Claus is here to stay, I’m sure, but this Christmas, and every day I have with them, I am passing on to my children one of the greatest gifts Santa or anyone could ever give: a love of truth. ← Simple mathematics is the key to happiness. Who knew?